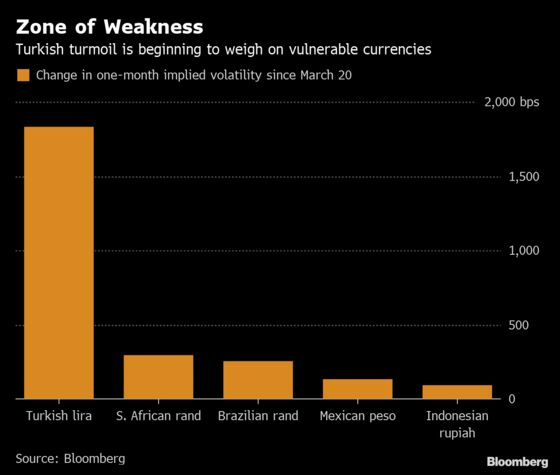 (Bloomberg) -- The most vulnerable corners of emerging markets are bracing for turbulence as Turkey’s stand-off with investors begins to test the nerves of traders. Volatility in the lira has posted the biggest four-day surge since 2004 as officials adopt measures to create a scarcity of the currency to prevent a slump in its value. As overnight borrowing rates crossed 1,000 percent, traders have dumped the nation’s stocks and bonds days before an election that will test the popularity of President Recep Tayyip Erdogan. Still, the reaction from elsewhere in global emerging markets has been muted. The MSCI EM Currency Index is down less than 1 percent since the turmoil erupted last week. Further losses will depend on what actions are taken by Turkish authorities.